I made these tasty little fresh fruit tartlets for our 4th of July BBQ dinner. 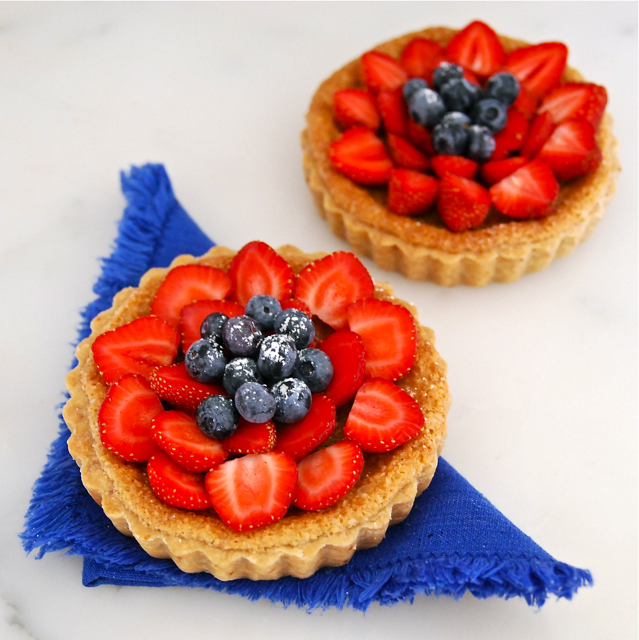 Fresh strawberries and blueberries on a shortbread crust with a cashew frangipane filling. I would have used a more traditional almond filling if I was going to top them with peaches or apricots but because I used berries, I felt that cashews would be a better fit. These are, of course, dairy, egg, and cholesterol free. An almost guilt free dessert. I didn't cook the fruit in the frangipane, which is more traditional. The strawberries and blueberry were fresh from my garden and I just couldn't do it. After the tartlets cooled, I filled them with fruit and dusted them, very lightly, with a little powdered sugar. No cooked sugary glaze here. I started with a shortbread crust. It's a sturdier dough that will hold up better out of the pan. You can make one bigger tart or 6 small ones. Mix all of the ingredients together and divide the dough into equal sized balls. Roll out each ball to a disc slightly larger than your tart pan. Having a scraper really helps with this process because the dough is soft and a little sticky. Line each tart pan and push the dough into the flutes. I made the filling from cashews, non dairy creamer, Earth Balance butter substitute, organic cornstarch, raw sugar and vanilla. I baked them for about 30 minutes until they were golden brown. When they cooled completely, I topped them with fresh fruit. These tartlets can be made a day ahead and topped with fruit right before you want to serve them. You can get creative and use pine nuts and peaches or almonds and apricots. Whatever combination you choose, they're going to be tasty! Cut the non dairy butter into the flour mixture with a pastry cutter until the dough comes together. Lightly flour your counter top and rolling pin. Roll each ball out slightly larger than the tart pans. Press the dough into the pans so that it fills all of flutes. Put some whole cashews in a food processor and pulse until they are very fine. Add the non dairy butter, sugar, and cornstarch to the processor and pulse until combined. Combine the vanilla and the creamer. Slowly add the creamer to the processor as you pulse until it forms a batter. Divide the batter equally between the 6 tart shells. Put the tartlets on a baking sheet and bake for 30 minutes or until golden brown. Add any type of fresh fruit or berries and dust with powdered sugar before serving.